This space… offered me an opportunity to celebrate life. The performance took me all the way back to when I was dragged to church as a child. The space was church-like; there were pews, praise dancing, an organ and Meshell Ndegeocello herself on bass, a collection plate, communion, tears, a call to action, a lot of ‘um hum preach sista/brotha’ outbursts, testimony and speaking in tongue and by that I mean, English and Spanish. I didn’t learn about the show until Wednesday, Dec. 7, after reading an article via TheRoot.com. 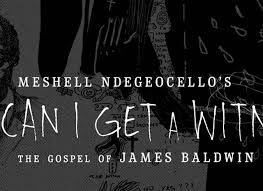 Lately, I have been sucking up all of James Baldwin’s work, so after Googling his name, I saw that this play would be happening. I learned soon after that all the tickets were sold out. It was set to run from Friday Dec. 16 to Sunday Dec. 18, but I did not give up. Everyday for the next couple of days, I went on The Harlem Stage website and ignored the “Sold Out” message. I had already made up mind that I was going and that I would get tickets but to my surprise I didn’t have to journey up to New York and buy tickets from a scout, which was my plan. A ticket opened up on Friday evening on the website and I screamed. On Saturday morning, I was on my way to NYC. I knew I had to be there, so when the play began I knew exactly why I had to be there. I needed this space to confirm that I was exactly where I needed to be at that time, that the universe will make provisions, and that trust is of utmost importance for the journey ahead. I stood there as the music ramped up, we were encouraged to dance if we felt like it, to move if we were inspired–just to soak in the energy in that space. I was hesitant at first, but then I remembered, I came for something; to give and to receive. So I danced, I mediated, I cried, I let go, I hugged myself and others, I participated and I had an amazing time. My Affirmation in this Space: I am exactly where I need to be at all times.